O powerful lord of Pytho, far-thrower, also a seer, whose place is high atop the Parnassus rock, of your power I sing: In turn, may your gift furnish me with glory and send your true voice into my mind so that, by the imposition of the Muse, I may disperse a fine song to the numberless races of men with the help of my well-made cithara. For now to you, O worker of the lyre, singer of pleasing songs, my spirit rouses me to tell of things of which I have never before spoken, when driven by the goad of Bacchus and lord Apollo, I described their terrible shafts, and likewise I disclosed the cure for feeble mortal bodies and the Great Rites to initiates. Truly, above all I disclosed the stern inevitability of ancient Chaos, and Time, who in his boundless coils, produced Aether, and the twofold, beautiful, and noble Eros, whom the younger men call Phanes, celebrated parent of eternal Night, because he himself first manifested. 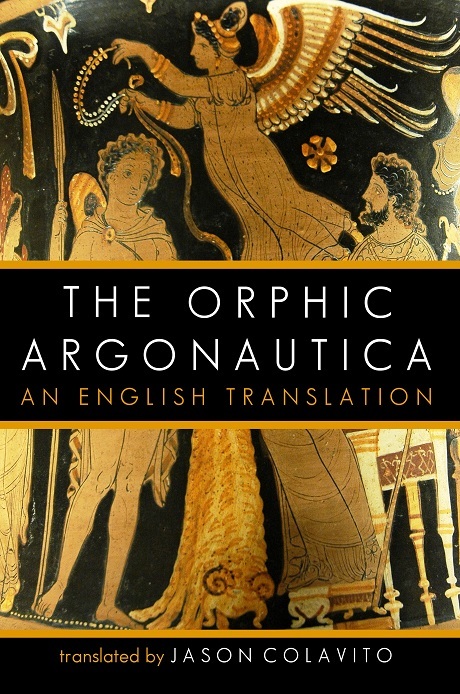 The Orphic Argonautica (OA) tells the familiar story of Jason’s quest for the Golden Fleece from the unusual perspective of Orpheus, the Greek mythological figure best known for tra-veling into the bowels of Hades in search of his dead wife, Eurydice. The first-person account given in the OA rehearses the familiar events of the Argonauts’ quest—from the building of the great ship Argo to the famous incidents on Lemnos and Cyzicus to the romance of Jason and Medea. In so doing, Orpheus repeatedly boasts of his own prowess and exaggerates his role in events, making himself the most important figure in the poem, an indispensible aid without whom the Fleece could never have been won. The poem also differs from earlier tradition in taking the Argonauts home by a wild and unclear route often interpreted as passing into the Arctic and along Britain and Ireland, which may well appear in the poem under the name of Ierne (see Appendix D). Given the hostility Victorian scholars felt for the poem it is perhaps unsurprising that there has been no complete, professional English trans-lation of the OA despite modern critical editions appearing in French (1987) and Italian (1994), as well as an older translation into Latin (1764). The longest section available in English has long been the three hundred or so final lines of the poem translated by William Preston in 1803 in the third volume of his poorly-received English edition of Apollonius’ Argonautica (reproduced in Appendix A). Since then, only fragments have been translated into English with three undistinguished exceptions. In 1885, Mrs. Angus W. Hall translated an 1820s German handbook of mythology by schoolmaster Friedrich Nösselt. Nösselt be-lieved the OA to be the oldest form of the Argonaut myth, and he drew heavily from it in his description of the Argonauts’ voyage. In translating the text, Mrs. Hall accidentally created one of the only reasonably close paraphrases of the OA available in English for more than a century. Another was Charles Kingsley’s 1856 children’s book Heroes, which used the OA as the foundation for its telling of the Argonaut myth, even borrowing some of the exact language of the poem. An eccentric, self-published 2005 English rendering of the entire poem by Siegfried Petrides received criticism for its difficulties with the English language and the translator’s choice to organize verses in a new order to “prove” that (a) the ancient Greeks under Jason had visited South America around 2200 BCE and that (b) all other versions of the Argonauts’ story were corruptions of this original, ancient voyage. Unfortunately, Petrides was only one in a long line of investigators to make fanciful claims about the supposedly astonishing revelations contained in the Orphic text, which has been closed to the lay reader without knowledge of ancient Greek except, conveniently, through the work of such spinners of wild theories. There is no original manuscript of the OA surviving from Antiquity; the poem is known through copies brought from Constantinople to Italy in the fifteenth century—three before 1450, and six more later. There-fore, the poem can be dated only through contextual clues. The author of the OA claims to be the demigod Orpheus himself, who composed its 1,376 hexameters sometime prior to his death. Thus, the poem asserts that it is a genuine pre-Homeric survival. Of course, nobody bought that. The tenth century CE Byzantine encyclopedia called the Suda (s.v. “Orpheus”) claims that the poem is the work of Orpheus of Croton, who was said to have lived in the time of the tyrant Pisistratus (sixth century BCE; tyrant of Athens from 546-527 BCE). Later, a school of thought attributed the poem to Onomacritus, a forger of the oracles of Musaeus in the time of Pisistratus (Herodotus Histories 7.6.3-5). According to the second century CE Christian writer Tatian, “Orpheus lived at the same time as Hercules; moreover, it is said that all the works attributed to him were composed by Onomacritus the Athenian, who lived during the reign of the Pisistratids, about the fiftieth Olympiad” (Address to the Greeks 41). On Tatian’s authority, a spurious antiquity was attributed to the Orphic poem. Other accused authors of the Or-phic poem have included the fourth- or fifth-century CE poet Nonnus, the author of the eccentric forty-eight book epic poem, Dionysiaca, and Cecrops, a Pythagorean philosopher of early date. A whiff of fraud, or at least something less than the noblest of ideals, clings to the OA for many reasons. First, the poem is manifestly fictitious in that it purports, impossibly, to be the work of Orpheus himself. Second, parts of the poem are something less than the original work of the Orphic poet. As André Hurst and M. L. West have shown, a passage in the OA describing the mysterious island of Demeter (lines 1199-1202, pp. 47-48 of this edition) borrows (plagiarizes) without significant alte-ration lines originally used in the lost sections of the Homeric Hymn to Dionysus to describe that god’s birthplace on Mt. Nysa. Of course, such minor literary borrowings pale in comparison to the debt the Orphic poet owes to his two predecessors, Apollonius of Rhodes and Valerius Flaccus, whose twin Argonautica poems were used as the OA’s sources, primarily and especially Apollonius. Literary analysis of the Orphic poem demonstrates clearly that it belongs to the last throes of Antiquity (see Appendix B). While the poem is intentionally archaic in places, mimicking the language and style of Homer, its Greek is clearly archaizing rather than genuinely old, mis-using or misapplying older words and phrases to seem like a product of great age. For example, the Orphic poet uses πίσυνος (“trust in”) to mean “obedient to” and the Homeric άλυσκάζω (“to escape”) where the Hellenistic word for loitering is called for. The wording is muddled; the grammar is challenging and confusing, sometimes using incorrect tenses and loose language. In terms of content, the poem’s closest relations are epics from the first few centuries CE. Like the roughly contem-porary Dionysiaca of Nonnus, the OA has a greatly reduced speaking role for the gods when compared with its Homeric counterparts, and unlike the Homeric poems, the Orphic poet gave a speaking part to an inanimate object, the wooden beam of Dodona embedded in the Argo, something Apollonius, following Homeric precedent, omitted. Introduction and translation copyright © 2011 Jason Colavito. All rights reserved.